Durango Police Department officers investigate a crash scene March 18 in the 2000 block of Main Avenue that killed two pedestrians. Police said Friday they are unable to determine the root cause of the crash. 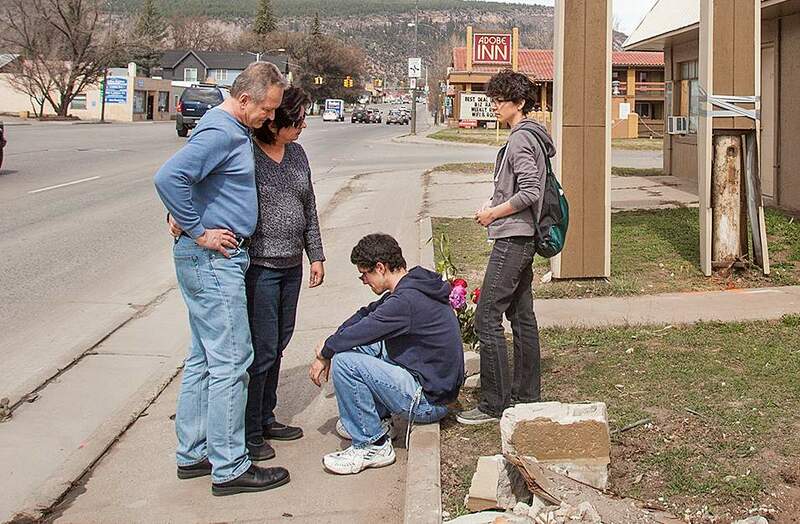 The family of Allen Duke visit the site where Duke was struck and killed by an SUV. From left, Allen’s father Brian Duke; mother, Emi Duke; brother, Evan Duke; and sister Bri Duke. Durango police investigate a crash scene March 18 in the 2000 block of Main Avenue that killed two pedestrians. 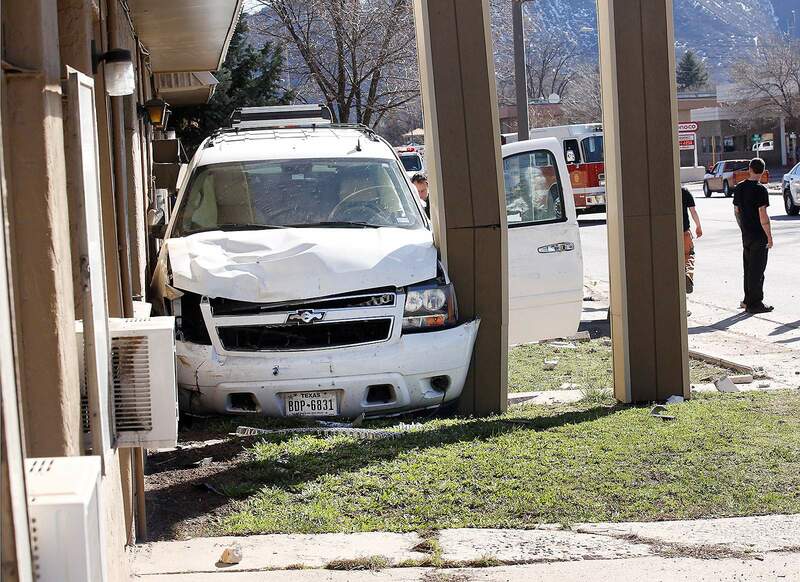 A part-time Durango resident who veered off the road and killed two pedestrians last month on north Main Avenue has been charged with careless driving causing death. After a lengthy investigation that included blood tests, medical exams and a review of the driver’s cellphone and vehicle computers, police said Friday they are unsure why Bobby Lehmann, 76, swerved off the road and struck Allen Duke, 23, and Marco Ricchi, 46. The crash occurred about 4 p.m. March 18 in the 2000 block of Main Avenue. 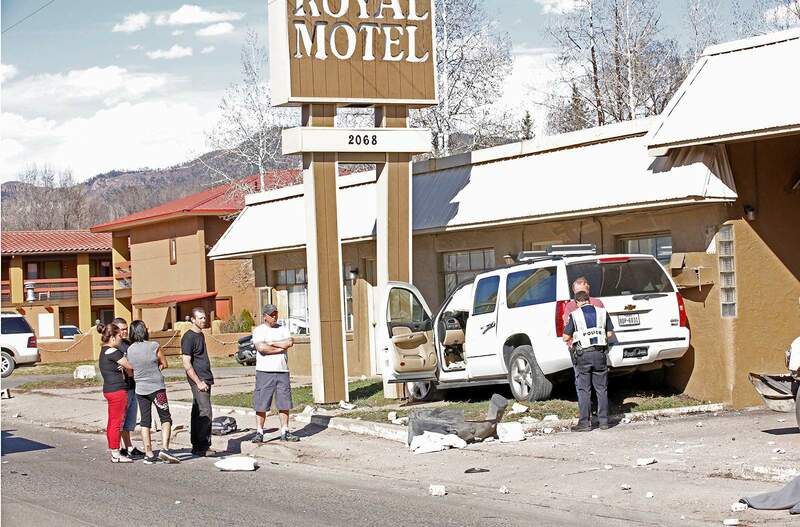 Lehmann was driving north in his white Chevrolet Suburban when the vehicle jumped the curb, hit the pedestrians and came to rest on its wheels, wedged between a Royal Motel sign and the motel itself. Lehmann, who suffered minor scrapes and bruises, said he didn’t remember the crash. Police speculated he possibly had a medical emergency, but medics at the scene cleared him, and doctors at Mercy Regional Medical Center were unable to find anything that would explain the crash, Newman said. Toxicology reports found no drugs and a trace of alcohol – 0.01 compared with a 0.08 for drunken driving – according to a blood test taken 1 hour and 49 minutes after the crash. Lehmann told police he left his house about 2 p.m. to run errands in town, including picking up his mail, a newspaper and going to Federal Express in Bodo Industrial Park. While in town, he went to Lady Falconburgh’s, where he had soup and a 12-ounce beer. He then headed home. Lehmann, of La Grange, Texas, owns a trucking company in Texas and has a vacation home in the Hermosa area. Police did a forensic analysis of the vehicle’s diagnostic computers, which showed normal driving behavior leading up to the crash. He was traveling 32 mph in a 35 mph zone when the vehicle left the road. It may feel unsatisfactory to the victims’ families and the public not to have a definitive answer to why the crash occurred, Newman said, but that is sometimes the case. The victims possibly stopped to talk to each other on the sidewalk. Duke was a front-desk clerk at Adobe Inn and had checked in Ricchi a day earlier. Ricchi of Latina, Italy, appeared to be on a tour of the Southwest, with stops at the Grand Canyon, Valley of the Gods and Monument Valley, according to Facebook posts. He was training to run a marathon. Duke was five weeks away from graduating from Fort Lewis College with a degree in accounting. The college plans to award him a degree posthumously at its commencement ceremony Saturday.